An early post this week – I will be busy through the 10th. This track, a steel guitar solo by Mr. Zafra accompanied by Mauro Baradi on a standard acoustic guitar, puts me in the strange position of not exactly knowing how to react when listening to it. It sounds awkward enough to be the first time the musicians have played the number…or, that could be my own cultural ignorance and the piece is meant to slowly lumber along. Probably the latter, as the flip side is a more standard, uptempo folk melody. Either way, I’ve always liked this, and have never found anything quite like it. Being from the Philippines, you can definitely hear the influence of 300 years of Spanish colonial rule. 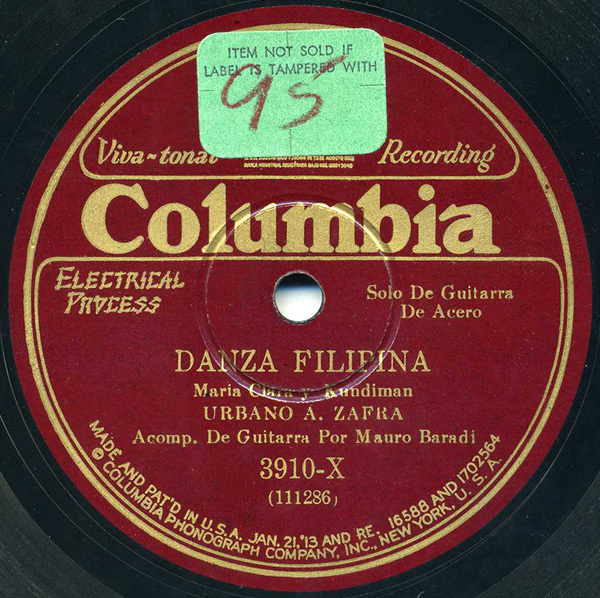 This was released on Columbia’s “X” (for “export”) series, and recorded in November of 1929, in New York City. Another great 78! I love the “very” relaxed playing style on this. Music for a hot languid day with many cold San Miguels. is there anyway I can get to hear this? you can here this track on woody’s october 29th, 2007 show, archived at WFMU. So I was bored one day and typed in my great-grandfather’s name into Google and did a seach, and this page came up. Dr. Urbano A. Zafra was my great-grandfather. Do you know where I can buy this cd? I would like to give it to my grandmother, Dr. Zafra was her father. My aunt was married to a gentleman named Urbano Zafra and resided in Washington D.C. many years ago. I wonder if this could be the same gentleman. Hi Steve. I remember my grandmother saying that her father was once married to an American woman with the last name of Farish. Did your aunt have a son with Urbano Zafra? This would have been my grandmothers half-brother, I think his name was Ramon. My mom Nina sent me this, her grandfather was Urbano…and its interesting that I’m a musician to, and never new I had a musician in my family! Thanks for putting this online! Manila Polo Club. Thank you. I am Urbano Sander Zafra’s niece. He was my father’s younger brother. Unfortunately, my Uncle Junior passed away more than 10 years ago. He had been living in Florida. Best wishes on your class reunion! I am Urbano A. Zafra’s daughter, finally after all these years I can hear music that my father played, wish I could have known this yrs ago. Also, Sander Zafra was my brother and we saw each other (with families) about a yr before he died. I am one e daugher of the lat Urbano A. Zafra. Please furnish me a copy of this CD. Iam from the Philippines. Please shoot me an email on how I can furnish a copy. Thanj you.